The 67mm Video Essentials DV Kit from Tiffen creates a new look with the "secret tools" of the movie industry. 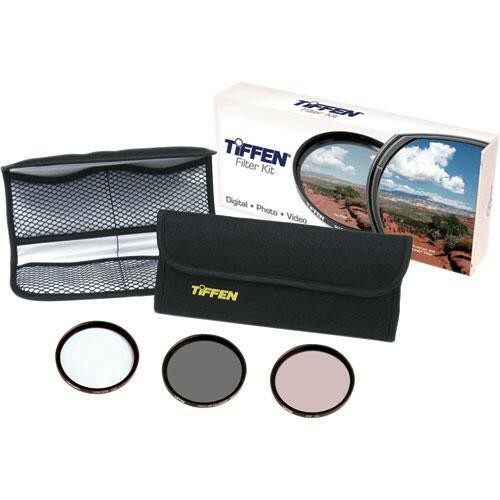 Tiffen gives you three of the most important filters that Tiffen can offer. One for protection, one for polarizing and the other for warming purposes. This kit is designed primarily for professional shooter using a prosumer DV camera to produce results that are more pleasing, less harsh and less brassy. Gives general protection to the optic. Prevents fingerprints, smudges and other contaminants from reaching valuable glass. Has no color temperature effect. This is a wonderful filter designed to bring significantly more "snap" to your images. If a traditional polarizer doesn't give you enough "zip", the "Ultra" polarizer gives you a little more. It will bump up your blue skies even more - making the difference between a good photo and a great image. Circular polarizers are specifically designed for use with auto-focus SLR cameras (They will also work on manual systems without problems). Tiffen's exclusive 812 Filter improves skin tones and is ideal for portraits taken on a cloudy day or outdoors in shade on a sunny day. Box Dimensions (LxWxH) 8.8 x 4.1 x 1.6"